Lathyrus japonicus var. maritimus.Robert W. Freckmann Herbarium.University of Wisconsin at Stevens Point.wisplants.uwsp.edu. www.floracyberia.net. (Accessed 5/2014). Lathyrus japonicus var. maritimus is a herbaceous perennial vine, colonial from rhizomes, stems to1 m long, stout, winged, usually reclining; stipules leaf-like, broadly egg-shaped 1.5-4 cm long, 1-2.5 cm wide, symmetrical, base lobed. Leaves alternate, pinnate, tendril replacing terminal leaflet, leaflets 3-6 pairs, alternate, 3-5 cm long, to about 2 cm wide, oblong to widest above middle, rather fleshy. Flowers purple, 1.5-2.5 cm, pea-flower-shaped, bilaterally symmetrical, calyx irregular; inflorescence of 5-10 flowers on a stalk. Fruit dry, hollow pods to 7 cm long. 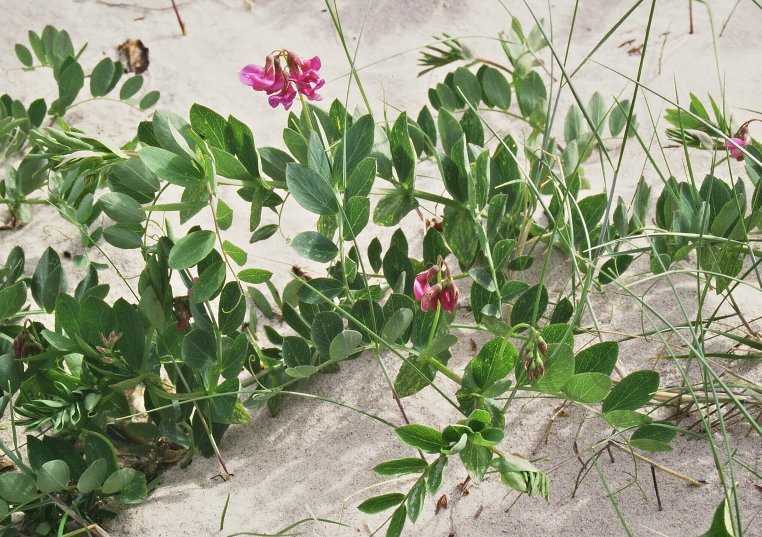 Habitat: Beaches above high tide line.